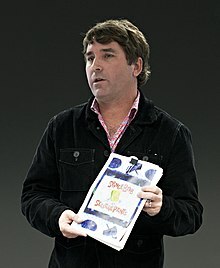 Hillenburg in 2011 presenting the original SpongeBob SquarePants series bible. Stephen McDannell Hillenburg (August 21, 1961 – November 26, 2018) was an American animator, cartoonist, and marine biology teacher. He was the creator of the Nickelodeon animated television series SpongeBob SquarePants (1999–), which he also directed, produced, and wrote. It has gone on to become the fifth longest-running American animated series. Born in Lawton, Oklahoma, and raised in Anaheim, California, Hillenburg became fascinated with the ocean as a child and developed an interest in art. He started his professional career in 1984, instructing marine biology, at the Orange County Marine Institute, where he wrote The Intertidal Zone, an informative comic book about tide-pool animals, which he used to educate his students. In 1989, two years after leaving teaching, Hillenburg enrolled at the California Institute of the Arts to pursue a career in animation. He was later offered a job on the Nickelodeon animated television series Rocko's Modern Life (1993–1996) after his success with short films The Green Beret and Wormholes (both 1992), which he made while studying animation. In 1994, Hillenburg began developing The Intertidal Zone characters and concepts for what became SpongeBob SquarePants. The show premiered in 1999 and has aired since then. He also directed The SpongeBob SquarePants Movie (2004), which he originally intended to be the series finale. However, Nickelodeon wanted to produce more episodes, so Hillenburg resigned as the showrunner. He went back to making short films, with Hollywood Blvd., USA (2013). In 2015, The SpongeBob Movie: Sponge Out of Water was released; the sequel to the 2004 film, it marked Hillenburg's return to the franchise, after he co-wrote the story and acted as an executive producer on the project. Besides his two Emmy Awards and six Annie Awards for SpongeBob SquarePants, Hillenburg also received other recognition, such as an accolade from Heal the Bay for his efforts on elevating marine life awareness, and the Television Animation Award from the National Cartoonists Society. Hillenburg was diagnosed with amyotrophic lateral sclerosis (ALS) in 2017, but stated he would continue to work on his show as long as possible. He died on November 26, 2018, a year and a half after his diagnosis. ↑ Otterson, Joe (November 27, 2018). "'SpongeBob Squarepants' Creator Stephen Hillenburg Dies at 57". Variety. Retrieved November 27, 2018. This page was last changed on 11 March 2019, at 18:44.